Juliana Hatfield's puts her own spin Olivia Newton-John's 80s-era hits. Juliana Hatfield was a darling of the '90s indie music scene. She played with Blake Babies and The Lemonheads and had a hit with the edgy pop song, "My Sister." Hatfield released a string of alternative albums since those days, full of distorted guitars and strong vocals. 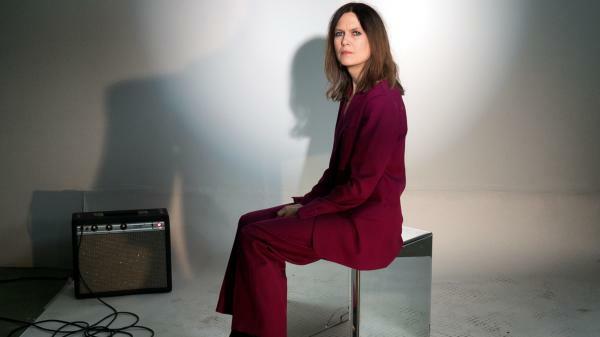 But now, longtime fans may be surprised at the gentler influence of her latest album, Juliana Hatfield Sings Olivia Newton-John. Hatfield says that she's considered Newton-John's music an inspirational thread for most of her creative life. The 14-track album, which was released earlier this month under American Laundromat Records, houses Hatfield's interpretations of many of Newton-John's best-known hits like "I Honestly Love You" and "Hopelessly Devoted to You" from the soundtrack of 1978's Grease, one of the films that helped make Newton-John a star. When asked if she identifies more with the character of Sandy Olsson, she says her idea of being viewed as the good girl has changed over the years. "I think I wanted to be the John Travolta character. I fancied myself a rock-and-roller, like a tough guy," Hatfield explains. "But in reality, I was a lot like Sandy and I hated that fact. I hated that I was sort of stuck in this role. I think people perceived me as sweet or cute and I just was always pushing against that because I didn't see myself as sweet or cute." Hatfield's renditions of "Xanadu" and "Physical" were melded to fit her own particular tone and delivery — an aspect Hatfield credits producer John Farrar with pulling off — but still stay true to the 1980's pop blueprint. "I chose to see it as a more of a darker song," Hatfield says of her version of "Physical." "I kind of wanted to dirty it up." A portion of the sales from Juliana Hatfield Sings Olivia Newton-John will be donated to the Olivia Newton-John Cancer Research Institute. Hatfield says that Newton-John is aware of the album and that she saw the decade-spanning star perform for the first time recently. Hatfield admits to getting choked up over the experience. "It was like seeing an old friend or something," she says. Juliana Hatfield was a darling of the 1990s indie music scene. She played with the Blake Babies and Lemonheads, and she had a hit with this edgy pop song - "My Sister." JULIANA HATFIELD: (Singing) I miss my sister. Why'd she go? She's the one who would have taken me to my first all-ages show. GARCIA-NAVARRO: Hatfield has released a string of alternative albums since those days full of distorted guitars and strong vocals. Now longtime fans may be surprised at a perhaps unlikely, gentler influence. She has a new album - "Juliana Hatfield Sings Olivia Newton-John." HATFIELD: (Singing) Please, mister, please, don't play B-17. It was our song. It was his song. But it's over. GARCIA-NAVARRO: Juliana Hatfield joins us from the studios of WGBH in Boston. Hello. GARCIA-NAVARRO: This makes my Gen X heart beat faster, I have to confess. Should people be surprised that you're a big fan of Olivia Newton-John? HATFIELD: I think that the people who've been following my life and my career are not surprised at all because I think that I've been mentioning her all along the way for decades just as something that's been a thread throughout my life. My love for her music has always existed, and I've never shied away from talking about it. HATFIELD: (Singing) Baby, can't you see there's nothing else for me to do? I'm hopelessly devoted to you. GARCIA-NAVARRO: This, of course, is a song from "Grease" where Olivia Newton-John's tidy schoolgirl character meets a leather-clad John Travolta. Which one of those two did you identify with? HATFIELD: Well, in my real life - in reality, I identified with the Sandy character very strongly. I related to the - what I call now - it's the good-girl curse - that she had that she tried to turn around at the end and kill the good-girl curse. But later in my life, I think I wanted to be more like the John Travolta character. Like, I fancied myself a rocker - a rock-n-roller, like a tough guy, but I was more - in reality, I was a lot like Sandy. And I hated that fact. I hated that I was sort of stuck in this role. I mean, I think people perceived me as sweet and cute. And I just was always pushing against that because I didn't see myself as sweet or cute. GARCIA-NAVARRO: Let's talk about Olivia Newton-John. Even though you've loved her music for so long, I understand you never actually saw her perform until very recently. What was it like to finally see her on stage? HATFIELD: It was wonderful. It was like - I got a little choked up at certain points just because it was like seeing an old friend or something. Or seeing her in person and seeing that sound come out of the person in front of me - it was really great. It was great. And her voice sounded great. It sounded really strong, and nothing was lost to the years. It was just - she was hitting the high notes at the end of "Xanadu," and it was fantastic. GARCIA-NAVARRO: You just mentioned "Xanadu," which I have to say is one of my all-time favorites. It's such a weird film. And it's such a cool, strange song. Let's listen. HATFIELD: (Singing) A place where nobody dared to go. The love that we came to know - they call it Xanadu. HATFIELD: I know. It was tricky. A lot of it was - we knew it was going to sound different just because my voice is a lot - it's a different sort of instrument than Olivia's. She's more of a quote, unquote, "real vocalist." And I'm just kind of like a scrappy - kind of a scrappy singer. My voice isn't as powerful, but yeah. What was I doing? The song - I think the songwriting with this stuff is so strong that I had this really solid foundation to work with. John Farrar - he did a lot of the writing and the producing and arranging. And he's really important to a lot of these songs and their - the original versions. And I think he should get a lot of credit. GARCIA-NAVARRO: I do want to hear your version of this song, you know, because a lot of Olivia Newton-John's music was sort of squeaky clean, poppy, but she had a huge hit that played to an edgy side - at least edgy for the '80s. Let's listen to "Physical." HATFIELD: (Singing) I'm sure you'll understand my point of view. We know each other mentally. You got to know that you're bringing out the animal in me. Let's get physical, physical. I want to get physical. Let's get into physical. Let me hear your body talk. GARCIA-NAVARRO: I remember this video so well - with her in the gym. GARCIA-NAVARRO: ...Sort of leotard and the leg warmers. Yeah, and the headband. HATFIELD: Yeah. And I went back and watched the video while I was making the album after not having seen it for many years. And it's pretty shocking when you see it today. HATFIELD: Yeah, I mean, there's like some fat-shaming going on, stuff that I don't think would really fly today. GARCIA-NAVARRO: What are you trying to do when you channel sort of your version of the song? HATFIELD: Well, on this song, her version is kind of - it's kind of funny. She sees the humor in it. It it's kind of a goof. But I chose to see it as more of a darker song. HATFIELD: (Singing) Let's get physical, physical. To me, I channeled the frustration in the song and the aggravation of, I guess, lust rather than to see the funny part of it. I just kind of wanted to dirty it up. GARCIA-NAVARRO: You can hear the aggravation. Olivia Newton-John has been battling breast cancer, and you're donating a portion of the profits from this album to her research center. I'd like to know if you had any contact with her. And has she heard the album? HATFIELD: Yeah, I think Olivia was aware that this was happening. And she has tweeted a couple of times about it, which was great. She digs it, and she supports it. GARCIA-NAVARRO: And I guess if she was listening, what would you tell her? HATFIELD: I would just tell her thank you. I almost want to cry saying that. I get choked up just because she's really been a thread through my life, just something I can go back to and escape to when things are rough or tough. And it's an escape to some place that's wonderful. And I would just say thanks, I think. Thanks for all the great music. GARCIA-NAVARRO: Juliana Hatfield. She sings Olivia Newton-John on a new album. Thank you very much. HATFIELD: (Singing) And it gets me nowhere to make you go. Would a little more love make you stop depending? Transcript provided by NPR, Copyright NPR.